A new Texas law cracking down on ‘sanctuary cities’ could inspire other states to take a similar approach, even as the changes spur strong opposition from local Texas officials. Republican Gov. Greg Abbott signed SB-4 into law in a Facebook Live event Sunday evening, effectively banning sanctuary city policies in Texas and giving law enforcement officers the right to ask the immigration status of anyone they stop. Under the law, officers who fail to comply, or cooperate, with federal immigration agents could face jail time and fines reaching $25,000 per day. “I was proud last night to sign this law ... What it means is that no county, no city, no governmental body in the state of Texas can adopt any policy that provides sanctuary, and second, what it means, is that law enforcement officials, such as sheriffs, are going to be required to comply with ICE detainer requests,” Abbott said on "Fox & Friends" on Monday. Texas is the first state to officially ban sanctuary cities under President Trump. Colorado passed a law in 2006 outlawing sanctuary cities, but the measure was repealed in 2013. So far, only Texas, Mississippi, Georgia, and Tennessee have officially passed bills into law banning ‘sanctuary policies.’ Virginia attempted two measures in the Republican-led legislature, but both were suspended after Democratic Gov. Terry McAuliffe threatened to veto. But Florida and Louisiana seem to be next in line to consider official policies. In Florida, HB 697, which would require county and local law enforcement agencies to comply with and support enforcement of federal immigration law, has passed two committees and is awaiting a full vote in the House. Louisiana’s measure, which passed out of a House committee last month, would prohibit sanctuary policies and require law enforcement to contact ICE agents if a person is detained for any reason and unable to provide proof of citizenship or immigration status within 48 hours. The Texas law is set to take effect on Sept. 1, and opponents have vowed to challenge it in court, after slamming it as the nation’s toughest on immigrants since Arizona’s crackdown in 2010. But Abbott said key provisions of Texas’ law had been tested at the U.S. Supreme Court, which struck down several components of Arizona’s law. The laws are not identical: Arizona’s law requires police to determine immigration status of people during routine stops, while the Texas bill does not require, but simply allows, police to ask whether a person is in the country legally, even if they are not under arrest. Nevada is also considering a sanctuary city ‘ban,’ after Republican Senate Minority Leader Michael Roberson announced he would lead the effort by pursuing a 2018 ballot question that would prevent Nevada from allowing sanctuary cities. Nevada doesn’t have any cities that declare themselves as “sanctuaries” and neither does Texas. But mayors throughout the Lone Star State were in opposition to the bill&apos;s passage, claiming it would weaken the relationship between law enforcement officials and the public. San Antonio Mayor Ivy R. Taylor also opposed the measure. “San Antonio is not a Sanctuary City—our officers work hard to perform a very difficult job, and SB4 makes that job even more difficult by requiring our local police officers to act as federal immigration authorities,” Taylor told Fox News. Last month, police chiefs throughout Texas signed a letter opposing the bill and urged the legislature to withdraw the bill. “This legislation is bad for Texas and will make our communities more dangerous for all,” the letter read. But despite their opposition, local officials aren&apos;t planning to defy the law. On Monday, San Antonio&apos;s Police Chief William McManus blasted Republican lawmakers for signing the new law, but said the department would abandon a policy that prohibited officers from asking about a person&apos;s immigration status, in order to comply with the ban. Sheriff Sally Hernandez of Travis County, which includes Austin, initially refused to honor federal detainer requests if suspects weren’t arrested for immigration offenses or serious crimes such as murder. 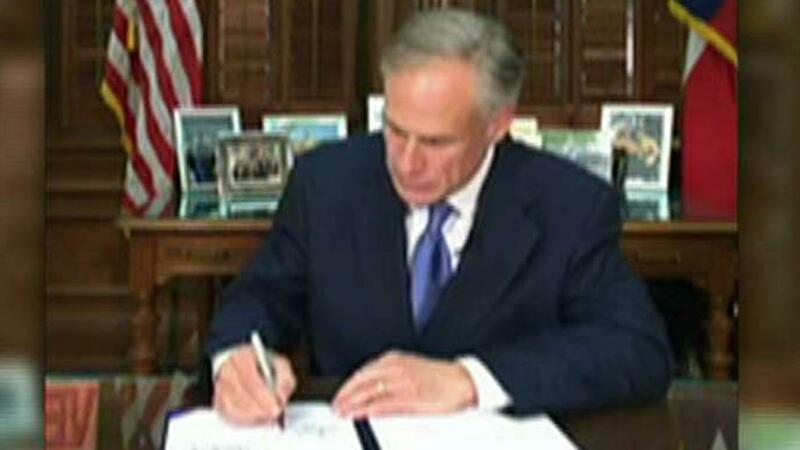 But before Abbott signed the bill, Hernandez vowed to conform to the ban if it became law. In El Paso County, meanwhile, officials could be in a tough spot. While the new law presses for cooperation with federal immigration officials, a settlement the county struck over a decade ago led to a policy barring deputies from enforcing federal immigration law. Still, the county sheriff&apos;s office does not plan to stand in the way of federal detainers.